Francisco Kjolseth | Tribune file photo Mike Leavitt, former governor of Utah and former Secretary of the U.S. Department of Health and Human Services, is one of the organizers of the Count My Vote election-reform initiative. The people who run the capital-R Republican Party in Utah should just come out and admit it. They are opposed to small-d democracy. They don&apos;t think it works, can work or should be tried. In fact, it&apos;s rather a puzzle why they don&apos;t try to do away with elections altogether. Unless it is because their candidates so often win those elections that to be so obvious about their contempt for elections just isn&apos;t necessary. Their 19th century thinking has spawned, and may lead to the success of, the Count My Vote initiative. That group has launched a petition drive that would force a statewide vote on their proposal to give primary elections, not caucuses and conventions, the final say in who represents each party in every general election. Republican Party leaders have made it clear over and over that they think their current means of nominating candidates for national, state and county offices  the deliberately exclusionary caucus and convention system used by Democrats and Republicans  is just fine the way it is. They will agree to only some minor, and meaningless, alterations in an attempt to head off the Count My Voter effort. It happened again over the weekend. 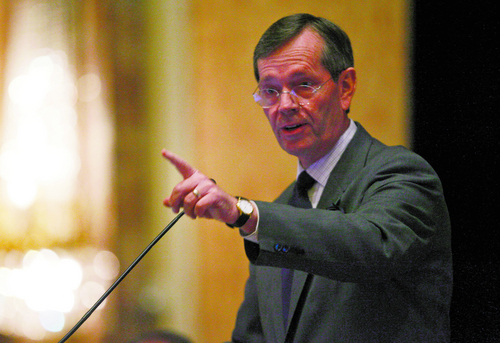 The Utah Republican Central Committee grudgingly adopted a few changes that would make it possible  though hardly inviting  for those who cannot attend a neighborhood caucuses to vote absentee on who will be delegates to county and state conventions. They were pointless changes. Not only are they complicated  requiring would-be participants to get their own ballots and find someone to take it, and a copy of their ID, to the caucus  but also meaningless. Even those who bother to go through the process would only be voting for convention delegates, not for actual candidates for public office. Republicans make no secret of the fact that they like the most important decision they make as a party totally in the hands of a self-selected elite, arguably those who devote the most time and energy to the process, but actually more likely to be radicals who hijack the party and its valuable spot on the November ballot. To be fair, Democratic Party leaders have kept their caucus system intact, also. But they win so few elections that it doesn&apos;t matter so much. Count My Vote would not necessarily end party conventions. It would just give other candidates a means to get on a primary election ballot. That would be democratic. And, if Count My Vote succeeds, it would be Republican, too.